Case has brought its new 12.5m Case IH 3050 VariCut header to LAMMA this year, which it claims it is the largest header in the world. Case says the header, which is making its debut in the UK, was developed to match the requirements of 12m Controlled Traffic Farming systems and it says is increasingly in use on farms throughout Europe. The company cite the header follows the trend towards ever-larger working widths and makes optimum use of the high threshing capacities of the latest Axial-Flow combines, features a number of new developments and innovative technologies. According to the company, new features include a rugged frame, double-floor design and one-piece reel. Case says this incorporates a patented reel protection system, which avoids contact between the reel and knife, particularly during knife extension or retraction, while the angle of the reel tines can be adjusted without tools. Case IH engineers have also improved the Field Tracker system, which uses four sensors that enhance the header’s ability when working on hillsides and uneven terrain. Case claims the new VariCut features are designed to ensure that the engine, threshing and cleaning systems of Axial-Flow combines operate at full capacity and efficiency, paving the way for fewer passes, reduced turnaround time and – in conjunction with the track systems available for the front axles of Case IH Axial-Flow combines – markedly lower soil pressure and improved sustainability. 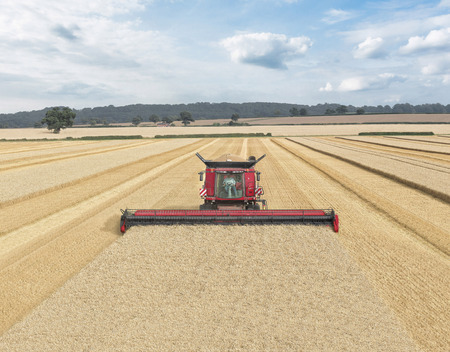 The Case IH Axial-Flow combine harvesters comes in a six-model range comprising of three ‘130 Series machines, the 5130, 6130 and 7130 from 299hp to 415hp, together with the larger ‘230 Series combines, the 7230, 8230 and 9230 from 449hp to 571hp. All are powered by efficient Case IH FPT Tier 4 SCR engines which deliver an average fuel saving of 10 per cent over Tier 3 power units.